Victory Belt Publishing, 9781628602623, 384pp. Step into the kitchen of renowned food blogger and low-carb guru Carolyn Ketchum as she shows you how to create mouthwatering keto dishes in her new cookbook, The Everyday Ketogenic Kitchen. She delivers a delectable array of recipes from easy family favorites to more gourmet, "date night" fare. Each recipe is made from fresh, accessible, whole-food ingredients and is free of grains, gluten, and sugar. From breakfast to dessert and everything in between, these recipes will inspire readers to get into the kitchen and enjoy cooking, every day. 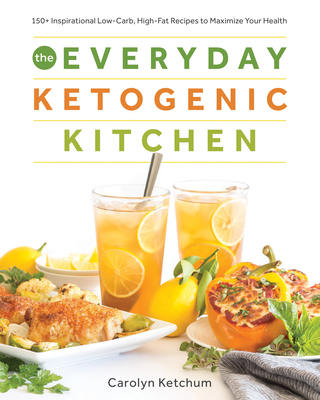 The Everyday Ketogenic Kitchen will enable readers to break free from the constraints of modern dieting and put them on a path to lifelong heath with a keto-adapted lifestyle. Ketchum teaches how to create keto-friendly recipes that taste just as good, if not better than, their unhealthy counterparts. Her recipes allow people to enjoy the taste, freedom, and sustainability of the keto way--without the restriction of typical fad diets. For aspiring home cooks, kitchen warriors, and anyone else looking for new and delicious low-carb dishes, The Everyday Ketogenic Kitchen is a must-have. Carolyn Ketchum is the writer, photographer, and evil mastermind behind All Day I Dream About Food, a low-carb and gluten-free food blog. Since its inception in 2010, ADIDAF has become one of the most popular low-carb sites on the web. With over one million page views per month, it has a devoted following among dieters, diabetics, celiacs, and those simply trying to live a healthier lifestyle. Kethcum's recipes and photos have been featured in Women's Health, The Huffington Post, Diabetic Living, Redbook, and Shape and on Glamour.com, among other publications. Her mission is to prove to the world that special diets need not be boring or restrictive and that low-carb and gluten-free dishes can be just as good as or better than their conventional counterparts. It's astonishing what can be done with a bag of almond flour, a stick of butter, and a willingness to experiment!